The Hamilton Spectator recenly put out an appeal for people to send in memories of their favourite local restaurants. After the results came in and the eateries were tallied, Spec reporter Saira Peesker was tasked to write the story, Librarian Tammie Danciu researched and dug up old archival photos, and I was called on to draw some kind of map. Afterall, I am a self confessed map-maniac. 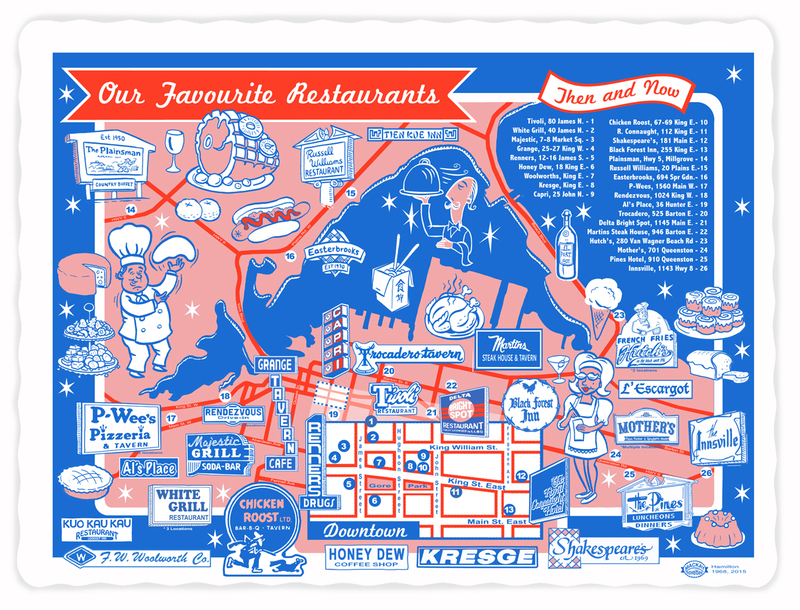 Maybe it’s my own experience with greasy spoons that an immediate visual lit off in my head at the mere mention of the words “map” and “diner”, was the simple often under-appreciated image of a paper placemat. While at age 46 I’m too young to remember many of the locations on the map, the experience is quite familliar eating in similar retro establishments common all over North America. As a kid, I loved poring over the neat little drawings on paper placemats, particularly on road trips to the beach. I’d be totally in my element with my family, in a restaurant booth somewhere in northern Florida waiting for my order of chicken & fries in a basket while anticipating in the excitement that laid ahead gazing upon a welcome to state paper placemat map. It was a complete delight to use those memories as inspiration to come up with this map. They’ve been running all summer. Now comes the 30-day sprint to the finish. The campaign for the Oct. 10 Ontario election gets underway Monday when Premier Dalton McGuinty visits the lieutenant-governor to formally drop the writ and dissolve the Ontario legislature. The vote is expected to be a referendum of sorts on McGuinty and the Liberals, with their healthy majority – won in 2003 atop cresting public dissatisfaction with Conservative spending cuts – hanging in the balance. Chipping away at an apparent Liberal lead are the reborn Progressive Conservatives, who are embracing the “progressive” part of their moniker in an effort to distance themselves from the slash-and-burn days of Mike Harris and Ernie Eves. The issues and tone expected to shape the campaign were in full evidence Sunday, as Conservative Leader John Tory trashed what he called McGuinty’s record of broken promises and the Liberal leader took aim at a Tory proposal to fund faith-based schools. The Conservative and Liberal platforms are similar in many ways, with both promising more money for health care and education. The New Democrats have yet to unveil their platform, but Leader Howard Hampton has made several campaign pledges of his own in recent weeks.